Our range of products include two colour non woven bag printing machine, four color non woven bag printing machine, non woven bag printing machine and non woven printing machine. A flourishing enterprise in this domain, engaged in presenting a wide range of Two Colour Non Woven Bag Printing Machine. This machine is capable of printing one color on either side of the bag. On the other hand, a 2+0 color blend can also be accomplished utilizing direct litho printing. Further, the machine is identical to the other unit, but is without the reel stand. In addition, this machine can be mounted without the reel stand. Apart from this, it can print a 2-color satellite effortlessly. Non-woven double colour fabric bag printing machines satellite model is 3-in-1 Model Machine suitable to print two cut colours in single pass on Non-woven bags, Plastic and Papers. Prakash has developed next generation Non -woven Satellite model two colour bag Printing Machines to offer high quality print results on Non Woven Cloth Printing. 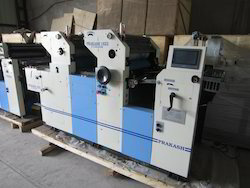 Prakash-222 Two Colour Non woven bag printing machine is developed with a classic modern designing idea. It is not only carrying on the advantages of Prakash NW-222 model, but also having more advantage in features.Prakash Offset Imported Non woven Bag to Bag printing machine (Satellite Model) is compact & has an efficient design. Prakash bi-colour non woven fabric offset printing machines have been specially made for quick printing to meet the requirement for quality short/long run jobs on non woven d cut bags & fabrics. We are delighted to offer our range of Spun bonded Non Woven Bags printing machine. In which you can print Pictures & Images, half tone jobs, background and screen jobs with decent print quality including maximum production. Prakash Eco Friendly Non woven bag to bag offset printing machines can accommodate any images you can produce. We give a nice machine to bringing out a best result in printing on non woven fabrics and to make beautiful bags for promotion & shopping.Nonwoven bags are made of spun bonded non-woven fabric, composed of 100% polypropylene filaments, which can be recycled, naturally decompose and completely incinerates without any production of poisonous pollutant. The non woven fabric is flexible, durable, waterproof, and stain resistant and is breathable. The fabric can be manufactured in various attractive hues from mild to dark colors. The non woven is used in the textile manufacturing industry to denote fabrics, such as felt, which are neither woven nor knitted. Fostered with vast industry experience and knowledge of this domain, we are engaged in presenting Four Color Non Woven Bag Printing Machine. The machine is capable of printing one color on either side of the web. Alternatively, a 2+0 color combination can also be achieved using direct litho printing. The machine is identical to the mono unit but is without the reel stand. The offered machine can be mounted without the reel stand. Also, it can be mounted on a 3-colour satellite to print 4+1, on a mono unit to print 2+2. Moreover, the offered machine is manufactured adhering to industry standards. Pioneer in the industry, we are engaged in presenting an impeccable range of Non Woven Bag Printing Machine. This machine has the capacity of providing 36,000 CPH speeds to 2:2 jaw type folder allowing two sets of nipping rollers, dynamically balanced R.T.F. roller, cutting cylinder, and jaw cylinder. 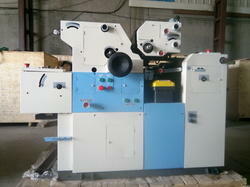 Moreover, the offered machine also offers RTF roller for 6 webs as standard. Also, this machine is manufactured using quality materials and modern technology. In addition, we can also manufacture and provide the machine according to the business needs. 3-IN-1 Machine Suitable to Print On Non-Woven Bags, Plastic Papers. Three Main Hard Chromium Faced cylinders Strongly Guarantee their Resistance and durability. Helical Gears drive system. Bearing type pull side lay with micro adjustment without stopping the machine. Chain Delivers with three gripper Bars. Front loading System. Multi sucker universal Feeder. Single lever Operation for Damping inking impression. Vertical Micro adjustment on plate Cylinder. Anti-Static charger to remove magnet from paper. Double sheet is ejected downward without interrupting the printing job. Reverse and forward inching. Automatic ink feed system. Skip feed function is realizable to ensure ink ensure ink density. Power supply cut- Off while opening delivery guard. Centralized oil lubrication system. Powder spray unit. Three ink form rollers keep image solid and stable. Exhaust fan for quick Drying. Shorter make Ready- Time. Pre- Set copy counter digital speed indication. Automatic ink cleaning Device. Jogger system to collect the bag and papers on delivery. Print with poly master plates. Compact stable structure. Full safety covers and guard and many more. We are reckoned as major entity engaged in developing next generation Non Woven Printing Machine. 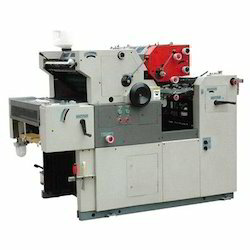 It is a sheet fed offset printing press trusted widely for its fully automated operation. The offered machine efficiently prints with poly master & plates, and features industry compliant construction from OEM approved components.